On to my menu plan for this week – I’ve got two recipes for you! One is a favorite, and one is new to me too. Stick around till the end of the post, too – I’m doing a cookbook giveaway! Monday: When I was at Sam’s a while back, I picked up a sample pouch of McCormick’s Crusting Blends – it’s the French Onion, Pepper & Herb blend. I’m planning to use this and do baked chicken tenders with sweet potato french fries, and fruit for dessert. Tuesday: Chicken Enchilada Soup – this is that favorite recipe I mentioned. I got this recipe from the family that “adopted” us when we were in college, and who we still are great friends with over 10 years later. We always asked to have this when we were invited over for dinner! I usually make it in the fall and winter, just because that seems more like soup weather to me, but we’ve got a rainy week ahead of us so it sounded good – plus it makes a TON, so we’ll plan on having this for two dinners and two lunches. We’ll probably have salad with it to get in our veggies. Ready for the recipe? Now remember, it makes a LOT. I’m halving the recipe, and we’ll still have enough for the four meals I mentioned. This makes it a perfect dish for serving to company, or to make at the start of a busy week. Sautee chopped white onion, green chiles and butter in a skillet over medium high heat. When done, add chicken. Stir and set aside. In a very large pot, put 6 cups of cold water and all the flour in. Us a whisk and stir until there are no more lumps of flour. Then add the 6 cups of chicken broth, bouillon cubes, and all of the spices. Cook on medium high to high heat, stirring continually until the bouillon is dissolved and the mixture is your desired thickness. Add the chicken/chile/butter mix to the large pot, and stir. Then add the 2 pints of sour cream. Stir, and cook until the sour cream is heated through. To serve, crumble tortilla chips in the bottom of your bowl, add the soup and then top it with cheese and chopped green onions. Wednesday: Leftover soup with sauteed squash/zucchini blend for a side. Thursday: We’re having some friends over, so we’re going to grill chicken for fajitas and make some guacamole. I’m still trying to decide what to do for dessert – any recommendations? In a medium bowl, mix together 2 tablespoons olive oil, paprika, oregano, and salt and pepper. Stir in chicken pieces to coat. Cover, and refrigerate for several hours. Heat 2 tablespoons olive oil in a large skillet over medium heat. Stir in garlic, red pepper flakes, and rice. Cook, stirring, to coat rice with oil, about 3 minutes. Stir in saffron threads, bay leaf, parsley, thyme, chicken stock, diced tomatoes, and lemon zest. Bring to a boil, cover, and reduce heat to medium low. Simmer 20 minutes. Meanwhile, heat 2 tablespoons olive oil in a separate skillet over medium heat. Stir in marinated chicken and onion; cook 5 minutes. Stir in bell pepper and sausage; cook 5 minutes. Spread rice mixture onto a serving tray. Top with meat mixture. So, we’ll see how it goes – if any of you have tried paella before and have suggestions, let me know! I know there are specific paella pans many recipes call for using, but I’ve also read you can get away with using a skillet or wok, so hopefully that will be the case. Saturday: We’re going to eat out somewhere – not sure where yet, but all I know is it’ll be a break from cooking & clean-up! Hopefully after reading this long post you haven’t forgotten the giveaway I mentioned! I have mentioned before that I think food makes a great gift. 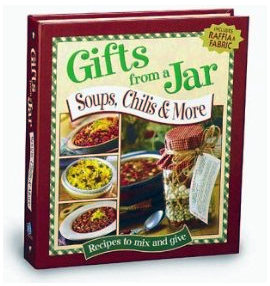 This cookbook is called “Gifts From a Jar” and it is centered around that idea. It’s filled with recipes for mixes – you place the dried ingredients in a jar, attach the recipe, and the recipient adds a few remaining items to make the dish. This book even includes fabric, raffia, and perforated recipe cards to use with the gifts! This giveaway is open to all US and Canadian readers. Entries will be accepted until midnight CST Monday, May 31. Mandatory entry: Follow me through Google Friend Connect (it’s located in my sidebar – just click “Join this site!”) and then comment letting me know you’ve done so. Already following through GFC? Comment and let me know. 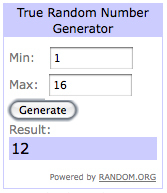 Edited to add – a winner has been chosen! Thanks for sharing the chicken enchilada soup! Do you think it would freeze? .-= FoodontheTable´s last blog ..Menu Plan Monday ~ Week of May 17 =-. I think it would freeze just fine, although I haven’t ever tried it before. I may do a test batch to see, because that sure would be nice to have on hand! Thanks for the recipes. Some day I’ll have to invite myself over for dinner ha ha (just kidding). Anyway, enter me in. I have your button, am following and I don’t know how you select your winners but I’ve seen a few sites use random.org. it selects a random number for winners. I’ve seen those jar books and am hoping I win! .-= Rebecca´s last blog ..Three Months =-. Concerning the fish, have you tried Orange Roughy yet? It’s a very mild tasting fish (and tender). There’s a recipe for Central Market’s Homemade “Fish Stixs” that might be good using it. 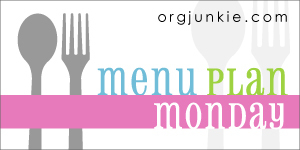 .-= Charla´s last blog ..Menu Plan Monday: 5-17-10 & Recipe for Rotisserie Chicken Tacos =-. Good luck with the fried fish- it does mask a lot of the fishiness, especially if you add your preferred seasoning to the fish fry mix. And your giveaway book is a lot like my Mother’s Day presents this year, except I only did cookie and brownie recipes! They turned out really cute, so I’ll probably make more for Christmas. Instead of flour in the Chicken Enchilada Soup try Masa Harina (corn flour) (Maseca brand is what we use). If you don’t think you will use a small bag quickly enough get with friends who also cook and split it up. It adds a great undercurrent of corn taste to any Mexican stew or casserole especially if you forgot to buy tortillas. Works great in chili too.